I don’t often get to games on a Tuesday afternoon but I’d taken some time off work and extended the weekend to a far more preferable five days. It should be like that all of the time, two days a week at work is sufficient for anyone. 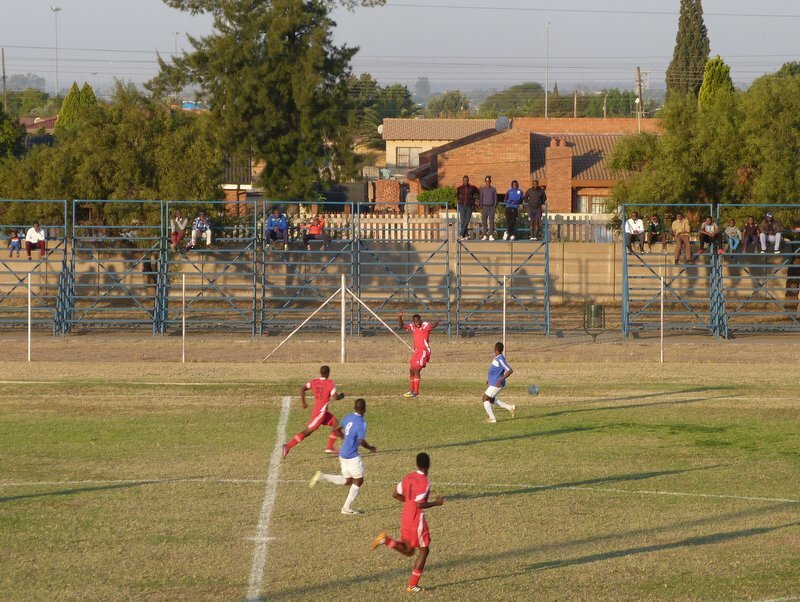 The third tier ABC Motsephe League game at Temba was the final event of a break that had started at Pretoria Station the previous Friday lunchtime. Jen and I travelled from there to Hoedspruit on the Blue Train. It’s very posh. 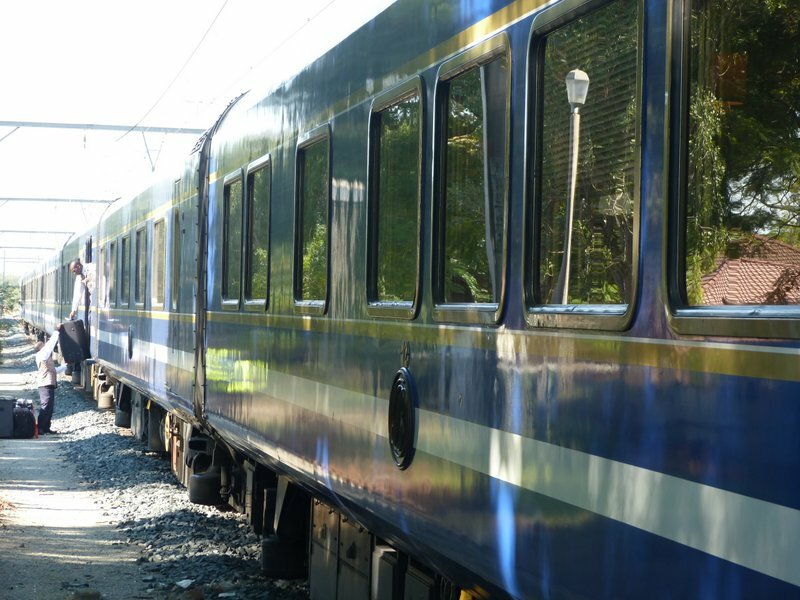 We’d been on a Premier Classe train last year where we had a fancy sleeping compartment, but this was another level. In fact, it was so posh that I had to buy a tie in order to be permitted to have my dinner. The journey eastwards could probably have been done in around four hours in a car, but it stretched to twenty hours on the train, stopping for what seemed like no good reason at any number of places on the way where locals on the way to or from work stared in though the window at over-dressed people glugging champagne. And whilst champagne is all very nice, it wasn’t the best part of the journey. 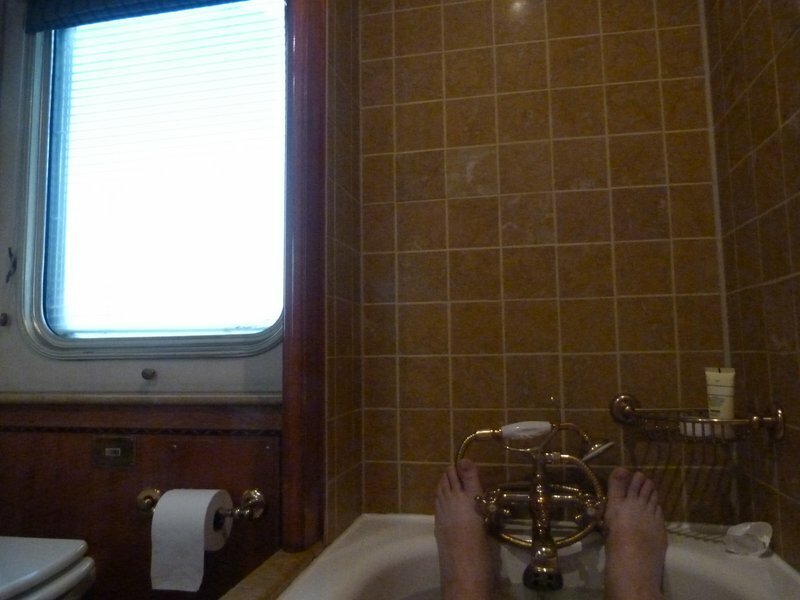 Oh no, the best bit was having a bath in our cabin. A bath! On a train! Does life get any better than that? I don’t think it does. The water slopped about a little at times as the train picked up speed but I didn’t care. I was hoping we’d pull in at a station just so people could see me lying there and then faint in shock at sight of someone having a bath on a train. In the bath. On a Train. Fresh from bathing on a train we spent the next three nights at the Thornybush Reserve, which borders Kruger. We had a bath there too, but it’s not the same as having one on a train. 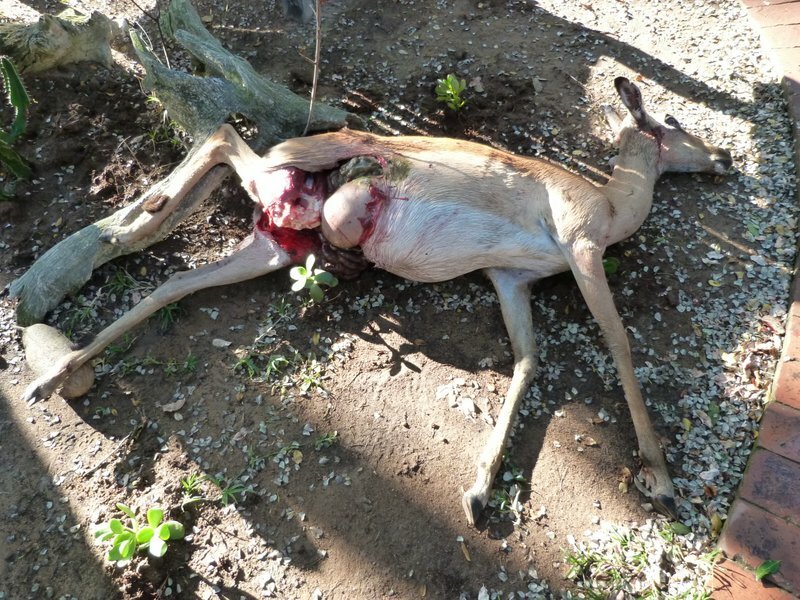 Where it did hold the advantage was in the wildlife. There was so much good stuff around that we even had a lion wander into the camp to chase around and kill an impala on the decking where we ate lunch. We didn’t see it as we were still in bed a few yards away but we saw the still-warm aftermath when we got up for breakfast half an hour or so later. As for stuff we were out of bed for, the leopard was probably the best. 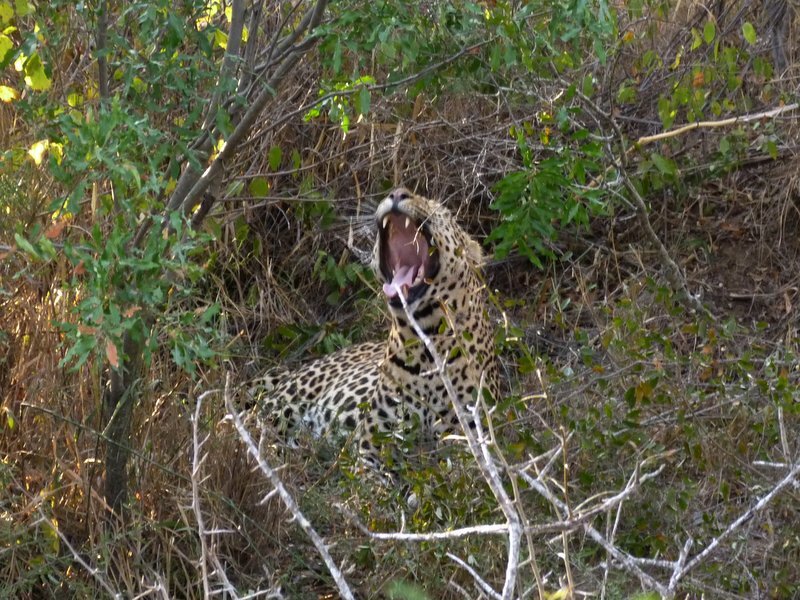 We managed to get up close to one that was dozing in the shade when the guide drove his truck through a few bushes. I was amazed at how big it was. It had a head the size of a basketball. It was more a yawn than a roar. When basketball head tired of being stared at and wandered off we then managed to loop around to meet it and see it out in the open. 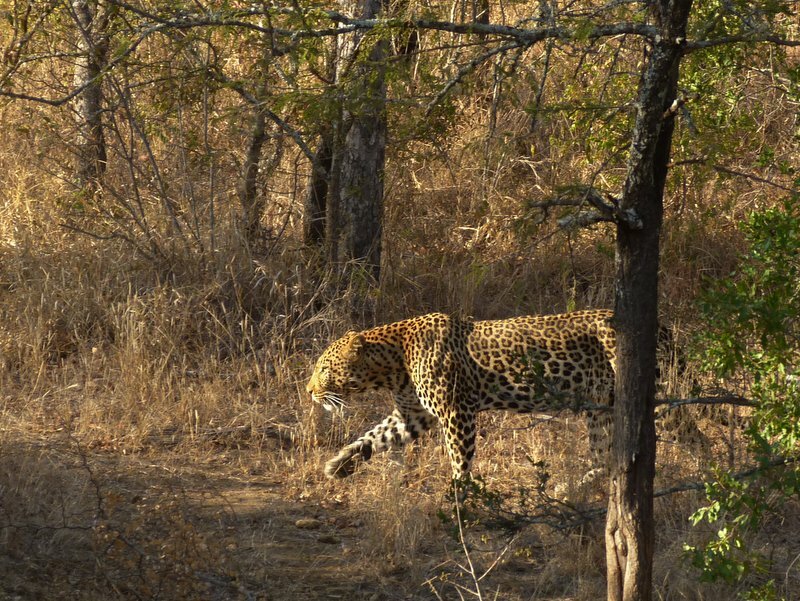 Sighting of leopards have been pretty rare for us in our two years in Africa, the best we’d managed up to then was when a much smaller one paused for a couple of seconds, stared at us and then disappeared. This was much better. Failing to conceal itself behind a tree. After three days of similar stuff we flew from the tiny Hoedspruit Airport to the somewhat larger OR Tambo in Johannesburg. 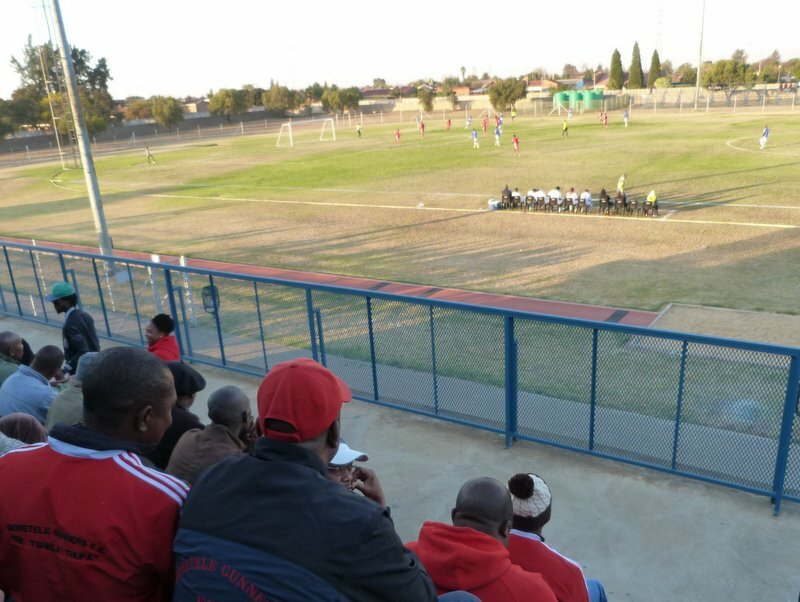 As I still had one more afternoon off work we headed for the Temba township an hour or so away up the N1 to squeeze in a match. 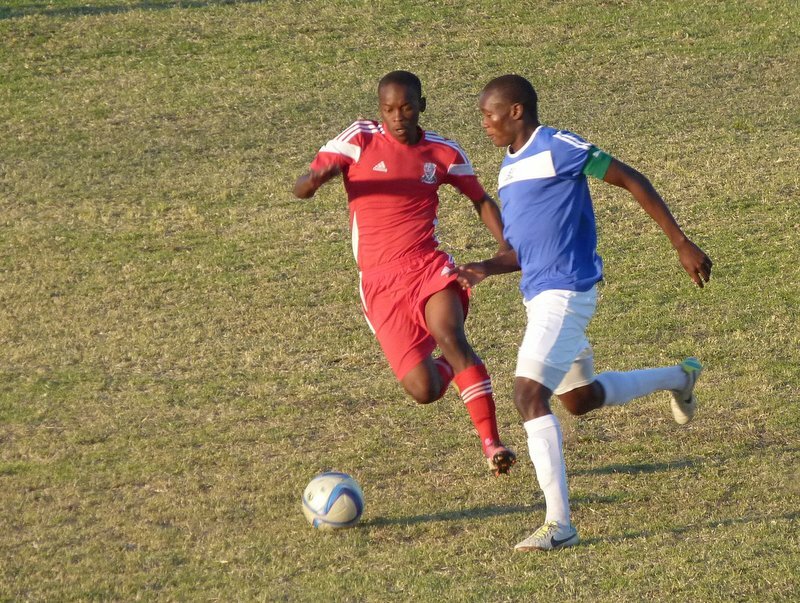 Most of the fixtures in the third tier ABC Motsephe League had been completed by this time of year but the North West Region had a backlog and they had used the public holiday to round off their season. 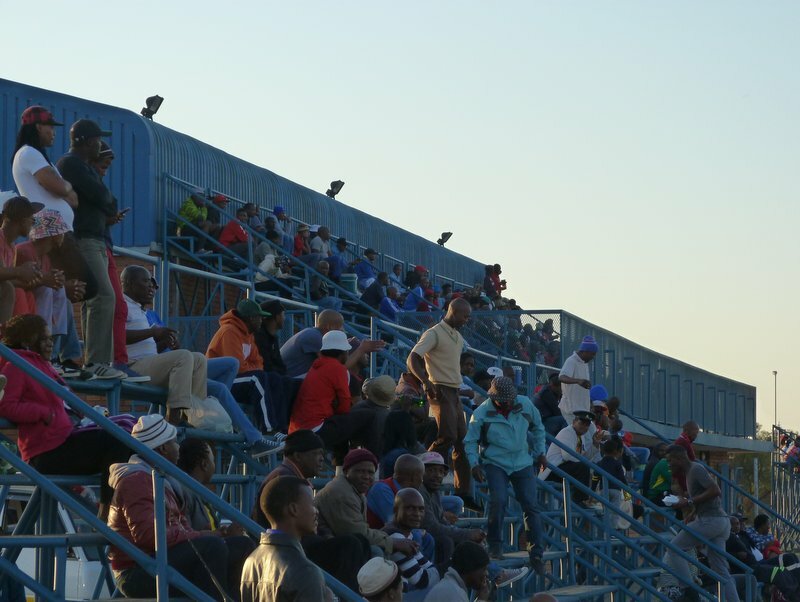 We actually been to the Temba Stadium a couple of weeks earlier, but it had been a wasted journey with the game having been called off at short notice. This time though we parked the car as the players were warming up on the pitch and the main stand was beginning to fill up. I had a chat with a bloke who assumed that we were there in some sort of official capacity. When I revealed that we were just there to watch the game he commented “You must really like football then.” Fair assumption, I thought, considering that it was a meaningless end of season game in the lower leagues. We took up a position on the back row of the bench seats and watched the fans come in. Most had a few cans of Castle, others a couple of large bottles of Hansa. It’s a public holiday. Football, beer and a seat in the sun. I doesn’t get much better than that. Unless there were leopards as well, that is. Or arriving on a train with a bath. The clock ticked around to three and the players continued to warm up. I wasn’t unduly concerned as games often start a little late, but with a desire to be out of town before dark I didn’t want too much of a delay. By three-thirty the warm-ups had gotten somewhat ragged with some of the players putting more effort into slapping each other than focusing on the drills. Three forty five came and went, as did four o’clock. The problem, it transpired, was that there were no match officials. Did that matter I thought? Would it really be an issue if one of the staff reffed the game? 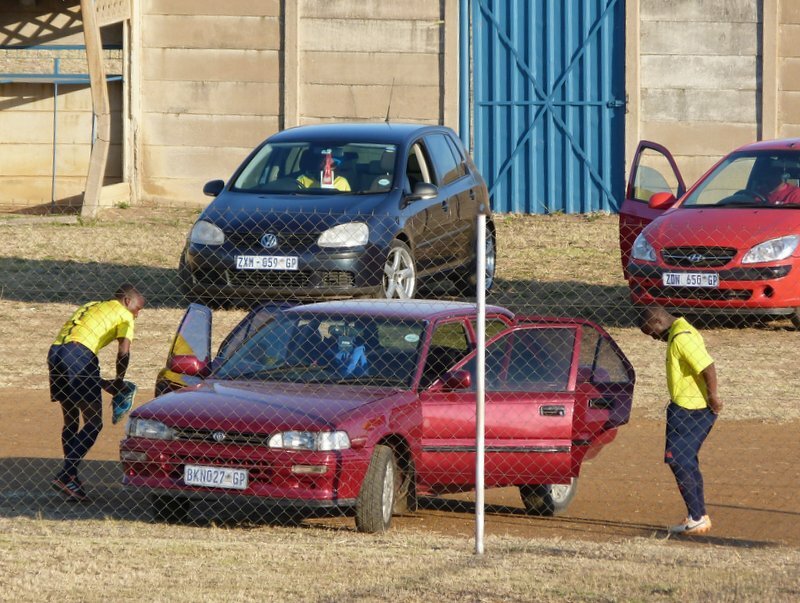 At quarter past four the ref and his linesman pulled up in an old Corolla. They were partially changed and completed the process next to their car. The crowd showed an impressive amount of patience as the linesman arsed around with their sock-ties. I doubt it would have been the same in England if Clattenburg had turned up a couple of hours late and then fannied around bosticking his wig to his head. Eventually, everyone was on the pitch and ready. Or almost ready. 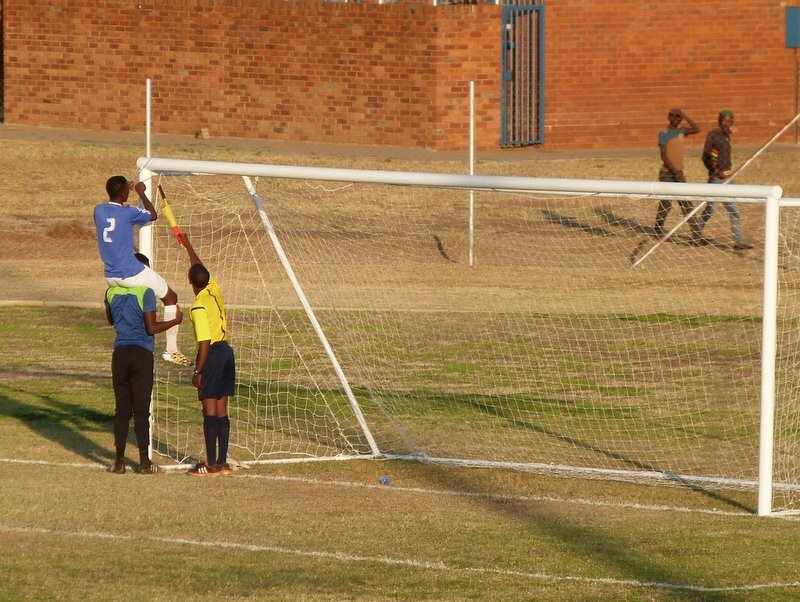 One of the nets wasn’t quite properly fixed and so kick-off was delayed for another couple of minutes whilst the necessary repairs were made. The game eventually started at twenty five to five, a quarter of an hour or so before the time that it should have been finished. I don’t usually include a lot of match detail in these posts, mainly because nobody cares, even me. After all, it’s not the Boro. This time though the lack of information is because we only saw the first ten minutes of action. Temba isn’t really a place to be after dark, especially when everyone has been drinking all day, and so we cleared off at the time I’d originally intended. Our plan for a daylight getaway was almost thwarted as someone had blocked our car in. Or at least they almost had. With some very careful manoeuvering I was able to reverse it through a gap with no more than a centimetre to spare on either side. Jen said it was the most impressive thing I’d done in the five years we’ve been together. I think that’s probably a compliment. 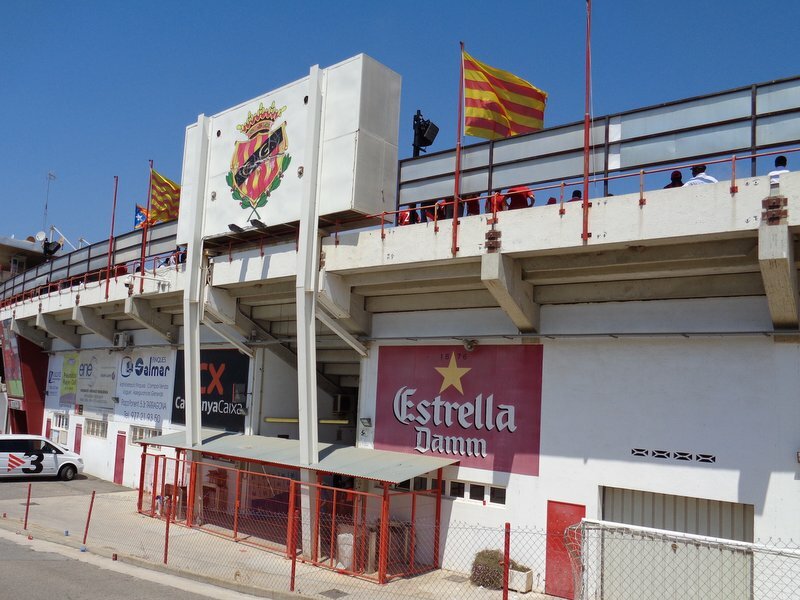 After the play-off game in Tarragona it was back to Tortosa with the opportunity to see a further match that afternoon. One game a day is generally sufficient for Jen and so I went to this one by myself. We were staying at the Parador that overlooks the town and it took less than half an hour to wander down the hill and over the river to the Estadi Municipal Josep Otero. It’s not often we stay in a castle. 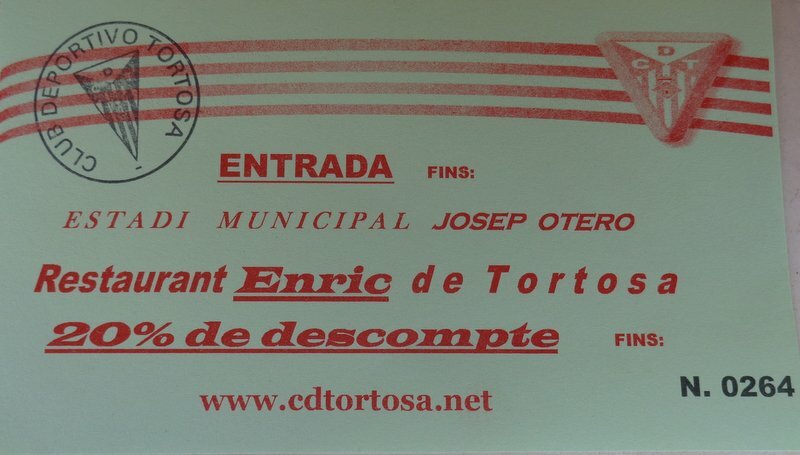 There wasn’t much going on in Tortosa on a Sunday teatime. I doubt there’s much goes on anywhere in Spain on a Sunday teatime and so it makes perfect sense to fill the void with a game of football. 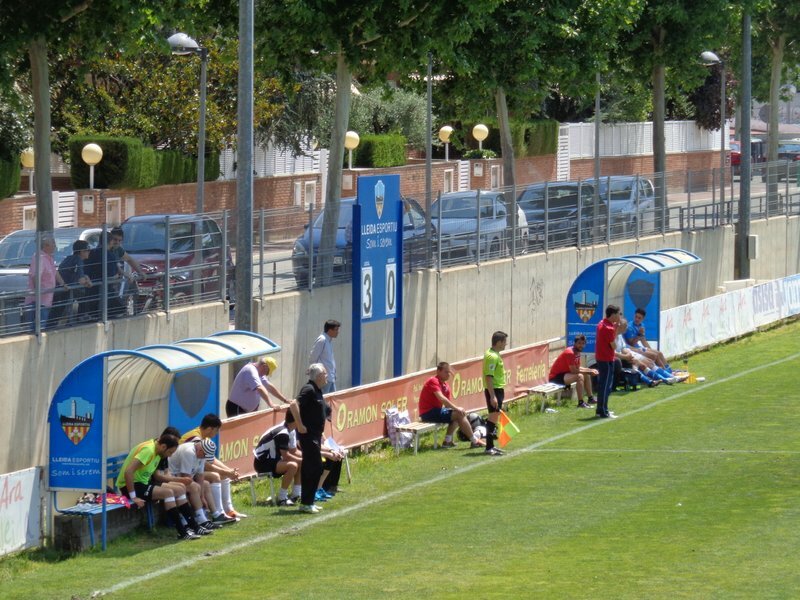 The previous day’s fifth tier game at Lleida had been free admission so I was a little surprised that for a game in the sixth tier Catalana Segonda I was directed to the hole in the wall that served as a ticket office. I was further surprised to be charged ten euros, the same price as at the third tier play-off game at Tarragona earlier that day. I suppose they know fine well that there isn’t much else for people to do once they’ve finished their lunch. And a discount on my tea. 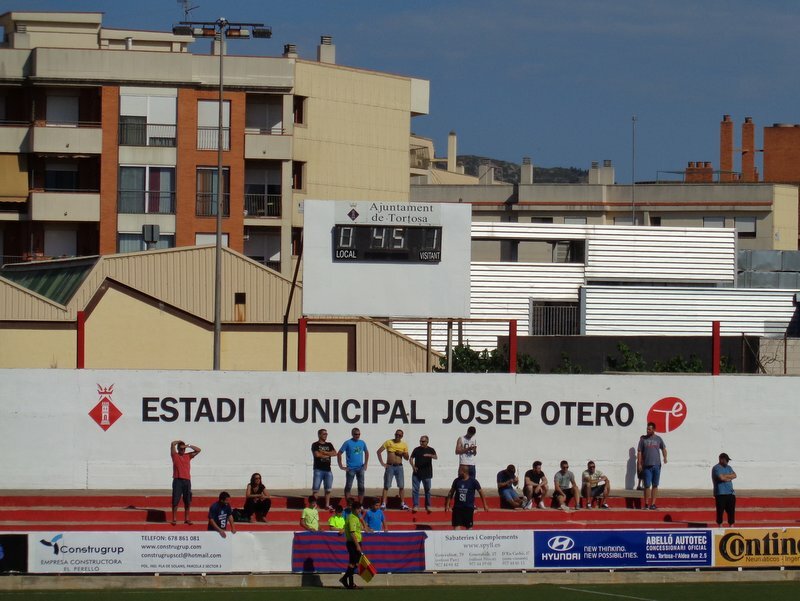 I’ve no idea who Josep Otero was (or is) but the stadium named after him had a seven row covered stand along one side and open terracing along the other. There were offices behind one goal and five a side pitches behind the other. The view from (and along) the main stand. 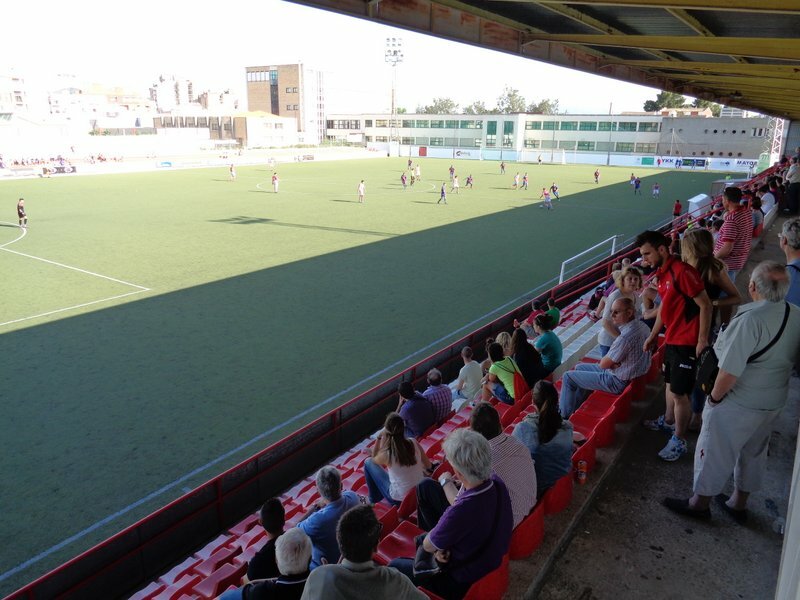 Most people sat in the main stand and as tends to be the way in Spain almost all of them knew everyone else and spent the first few minutes after their arrival greeting each other. I wondered how many games I’d have to go to before I’d get kissed on both cheeks by half the crowd. Not many I suspect. The fans on the opposite side of the pitch appeared to be Camarles fans. You don’t have to travel very far in the Catalana Segonda league and assuming that they were actually from Camarles then they will have had a twenty minute drive along the C-42. 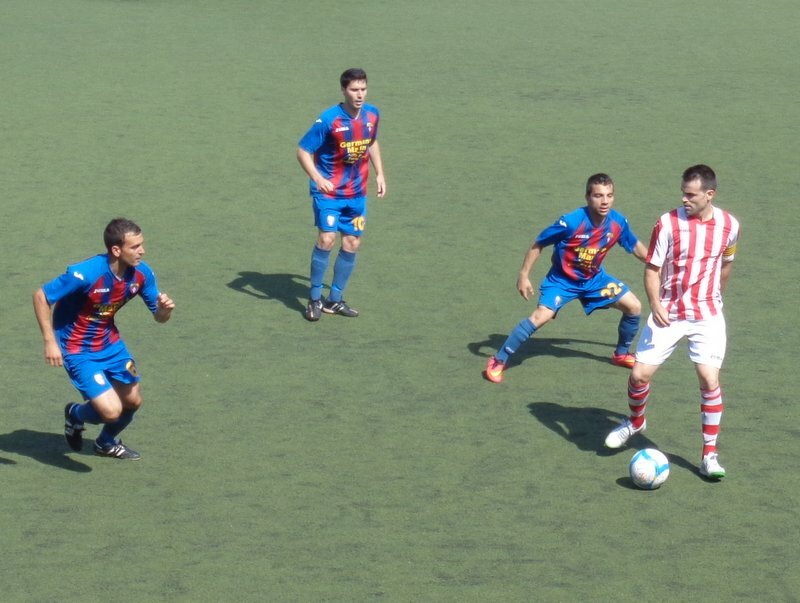 Tortosa were dressed up as Stoke whilst the visitors were sporting something similar to a Barcelona kit. The standard was pretty good when you consider that there are over a thousand clubs playing at a higher level in the Spanish pyramid system. Both sides managed to keep the ball well on the artificial pitch. One thing that could have been improved upon was the number of goals. Not the number of goals scored, but the amount of goalposts situated around the pitch. We had a pair intended for smaller cross-field games that weren’t too bad but the additional set behind each goal made it look like some sort of experimental trial into whether the excitement level could be raised by allowing teams to score into more than one goal. Part of what could have been described as a six goal thriller. As far as the action went, there weren’t many chances. The visitors broke the deadlock early on when one of their strikers spun his defender, picked the correct set of posts and fired Camarles into the lead. That one strike was sufficient to clinch the win in a meaningless end of season fixture. The celebrations at the end suggested that victory meant far more to the visiting fans than I’d have expected in the circumstances. There’s probably a bit of rivalry going on that I’m not aware of. With the game over I retraced my steps back through the town and up the hill to the Parador. 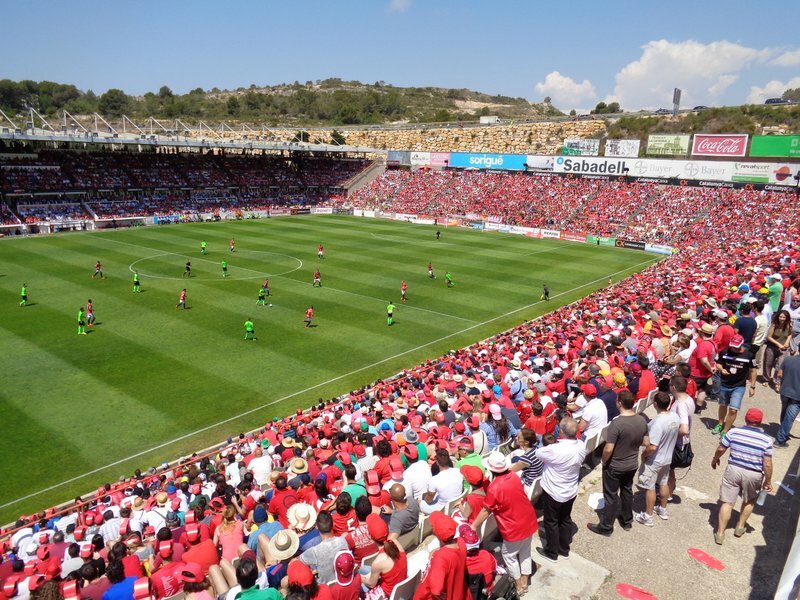 Gimnastic de Tarragona v Huesca, Sunday 31st May 2015, Noon. Another day, another game. 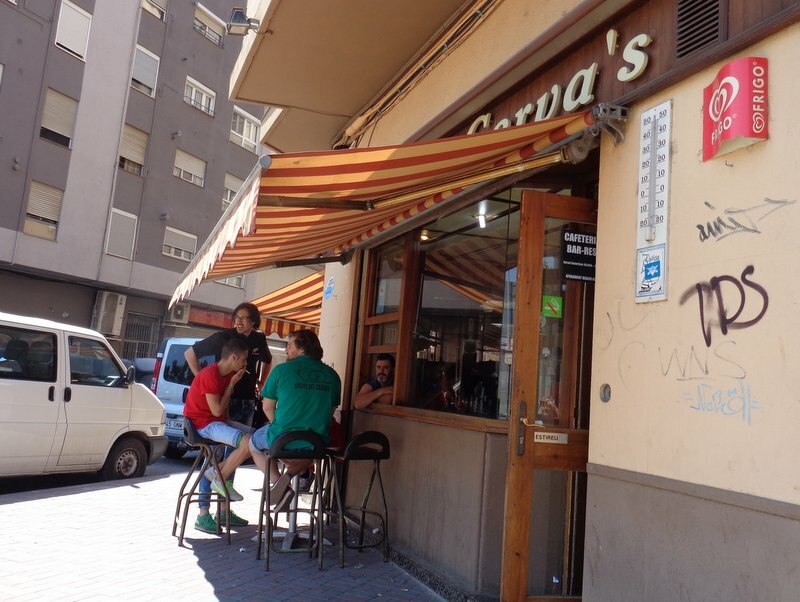 This time in Tarragona, about an hour’s drive from Tortosa. Or rather an hour’s drive to where the satnav reckoned the stadium was and then another hour’s drive around town trying to find the actual location. The Nou Estadi was actually built in 1972, so not very new at all really. 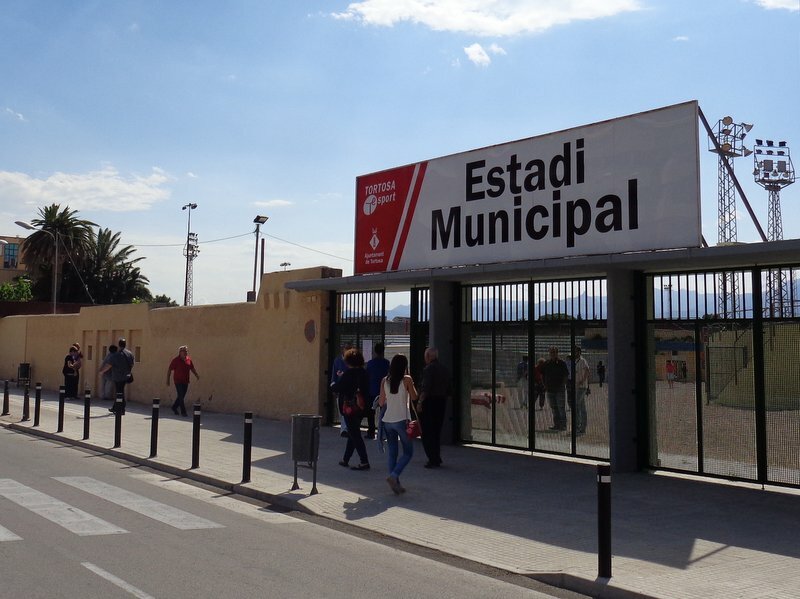 I wonder when it will just be known as the Estadi? And you’d think that after forty-odd years someone might have got around to erecting a sign or two pointing out where it is. We eventually spotted the ground five minutes before the noon kick-off but by then all the nearby parking had been taken and we ended up having to walk from about a mile away. 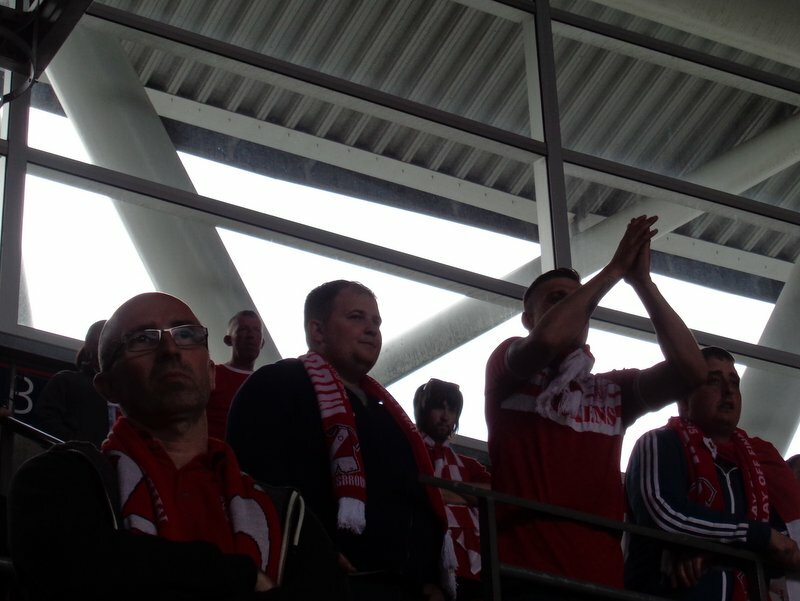 We were able to buy ten euro tickets for the uncovered stand along the side and by the time we had undergone the searches and taken our seats the game was already half an hour old. It’s 1.40 to the pound these days, so that’s about seven quid. There was a decent crowd with the other three sides of the sixteen thousand capacity stadium apparently full. 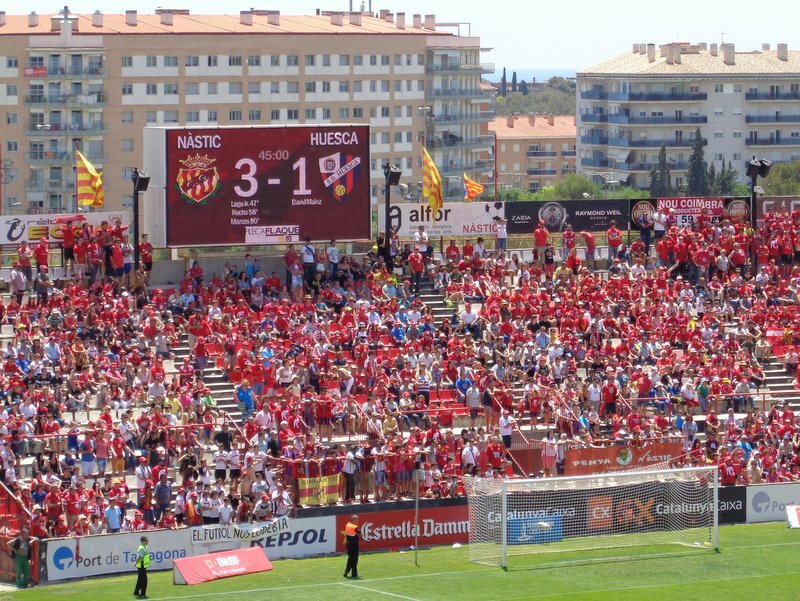 We had the Huesca fans at the opposite end of our section and a fair bit of space around us. For those who didn’t fancy coughing up their ten euros for a ticket the view from the road above the stadium afforded a decent view, certainly better than that of the away fans at St James’ Park. Whilst the previous day’s game at Lleida had been a fairly meaningless end-of-season fixture, this one had a lot more riding on the result. 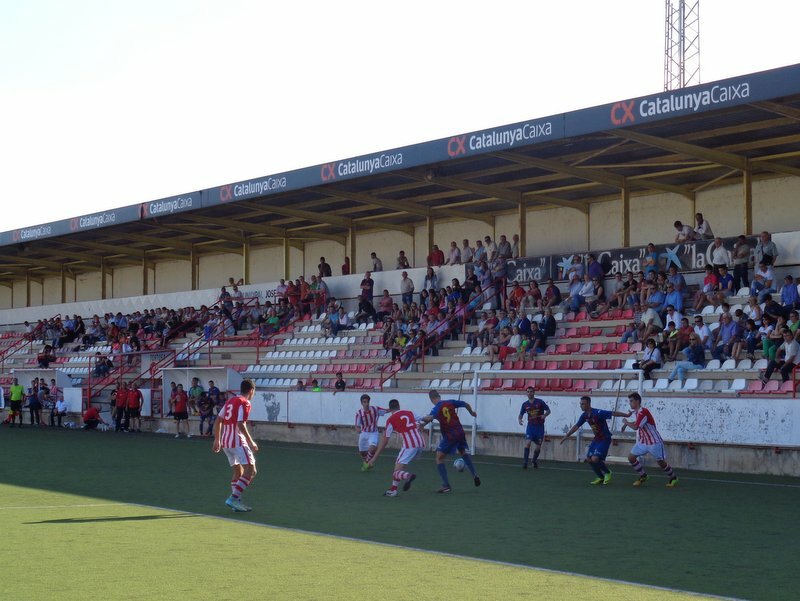 Gymnastic and Huesca had each finished top of their respective Segunda B divisions and were playing each other for a place in the second tier. 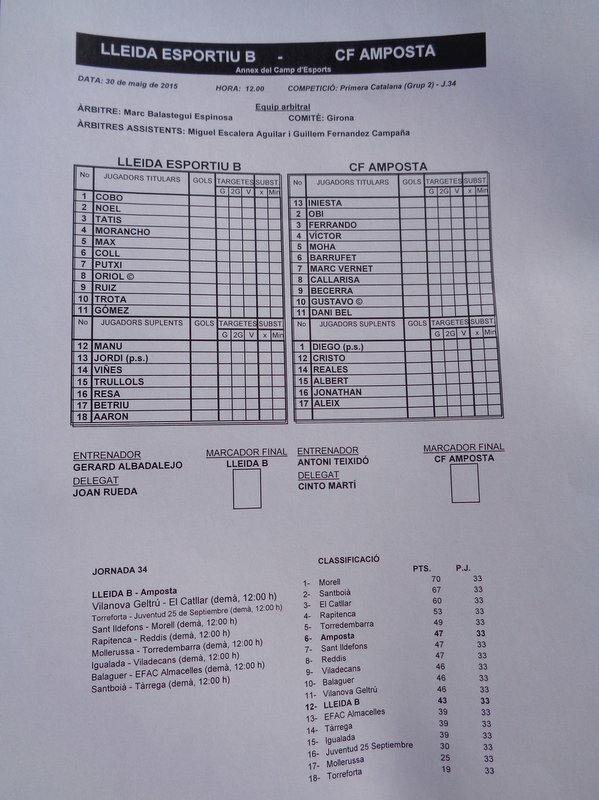 This was the second leg, with the first game at Huesca having finished 0-0. It’s a strange system. The four regional winners meet in two semi-finals, of which the two winners are promoted and go on to play each other for the overall divisional championship. The two losers drop into a further play-off that also involves the second, third and fourth placed teams in the leagues. Looking the other way from our seats. 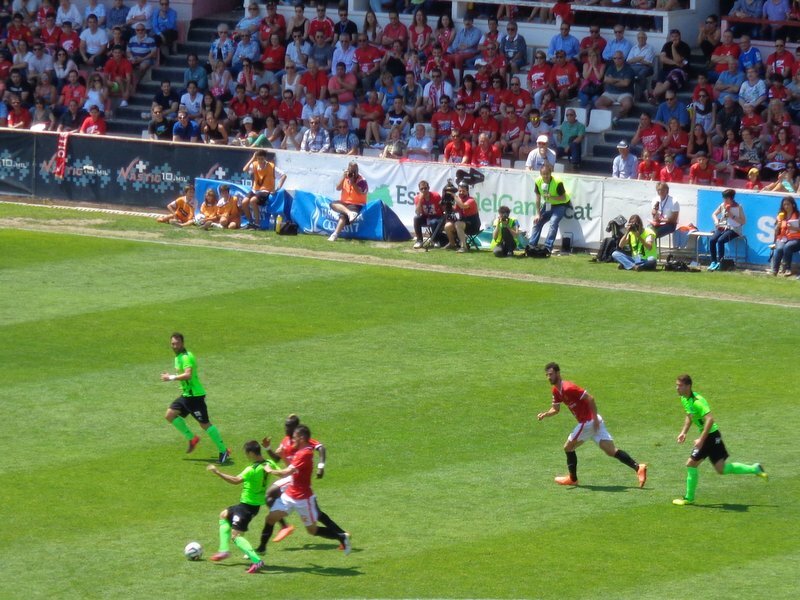 Nastic were in Man Utd kits, whilst Huesca could have passed for Jeonbuk Motors in their green and black strips. The games had been goalless when we arrived and it remained that way as we reached half-time. The home side took the lead soon after the restart with a long-range daisy cutter from Lago that struck both posts before rolling over the line. The goal understandably upped the tension and it boiled over when a Huesca player declined to give the ball back from a throw in after the Nastic keeper had put the ball out for a Huesca injury. The header from Rocha that put Nastic two up moments later raised tempers even further amongst the visiting players and they had Manolin sent off for what I believe is termed non-specific skullduggery. Man Utd v Jeonbuk Motors. At that point you’d have thought it was all over and Huesca might have turned their thoughts and energy to the next bout of play-offs, but they kept pushing forwards despite being two goals and a man down. 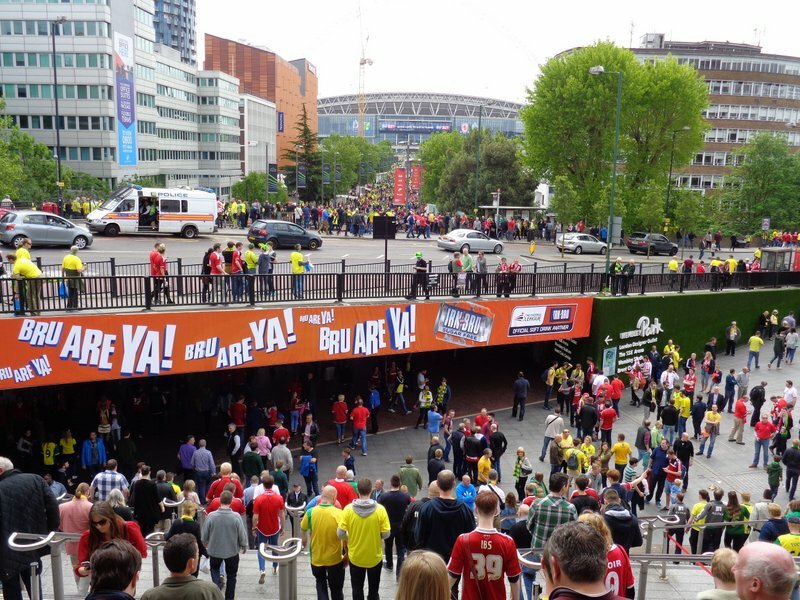 I couldn’t help but contrast their efforts with those of the Boro at Wembley six days earlier where I’d thought that we seemed to accept our defeat far too early in proceedings. At eighty minutes it really was all over when substitute Jiminez broke free and chipped the keeper from twenty yards to make it three-nil. The players celebrated as if they’d just been promoted, which I suppose they had. Huesca kept going to the end though and notched a consolation with a couple of minutes to go. 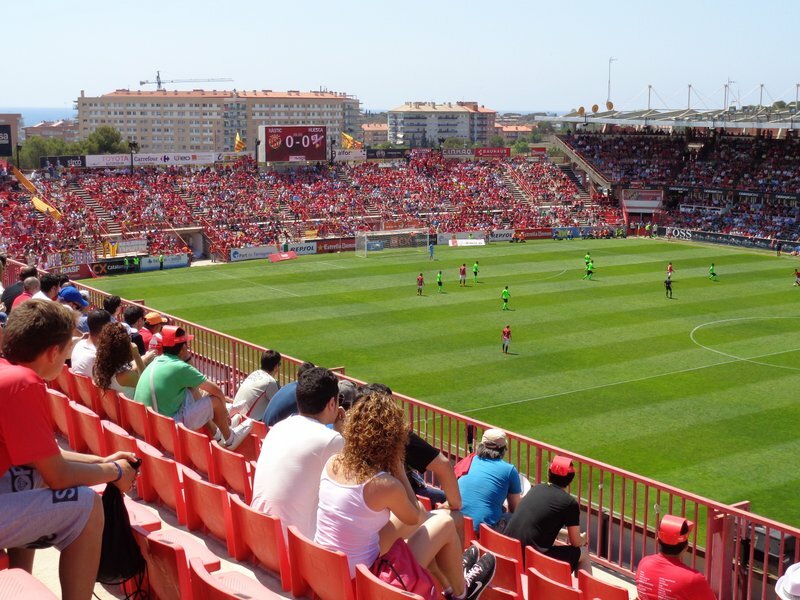 The win for Gimnastic secured the main prize of a place in the second tier and a two-legged tie with Real Oviedo to determine the overall Segunda B Championship. 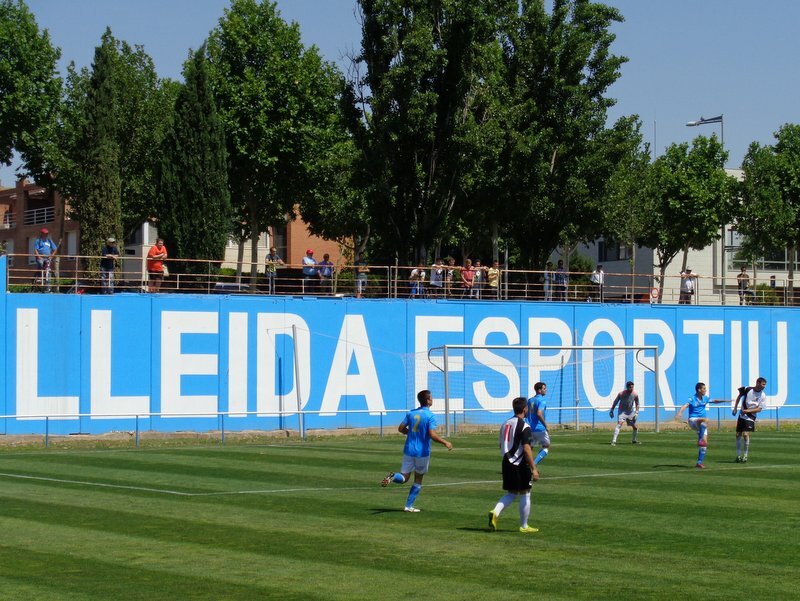 Lleida Esportiu B v Amposta, Saturday 30th May 2015, Noon. 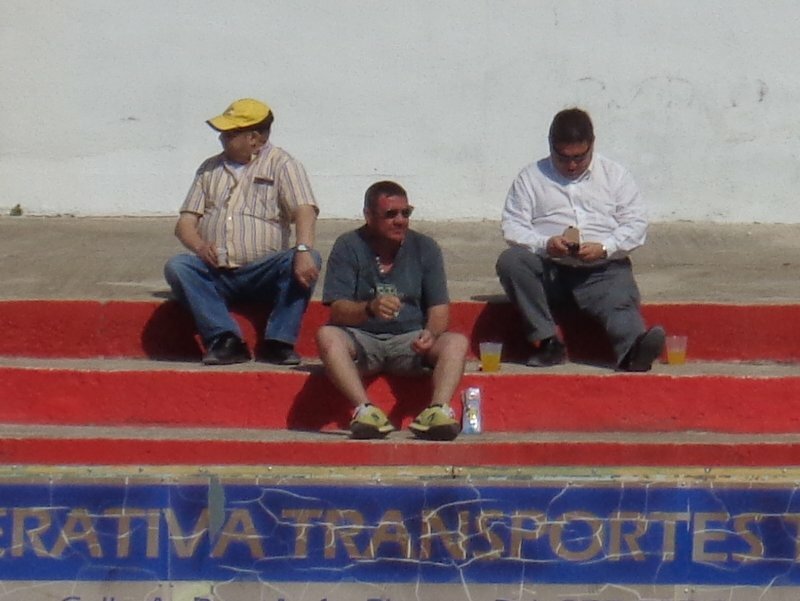 Whilst the Boro’s play-off defeat had brought the domestic season to an end in England there was still plenty of football going on elsewhere and a three day break in Spain on the way back to South Africa gave me the opportunity to take in some games. 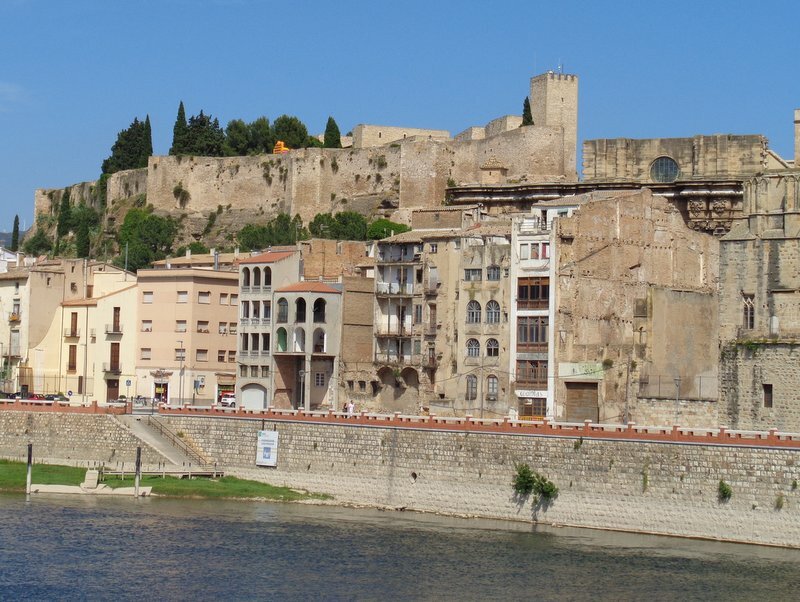 Jen and I were staying in Tortosa, a small town about seventy-odd miles from Barcelona. 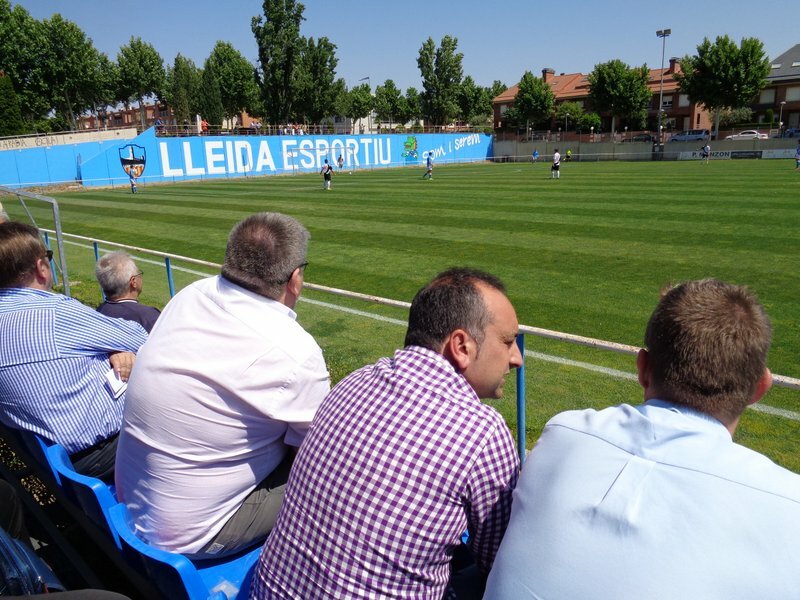 There wasn’t any information in the papers on the fixtures in the fifth tier Primera Catalana leagues but I was able to glean enough from the internet to find a game in nearby Lleida. Nearby that is, if a two hour drive counts as nearby. We drove over and occasionally through a variety of scenic hills, passing Riba Roja on the way. I recognised the area as I’d stayed there with my son around ten years ago on a fishing holiday. 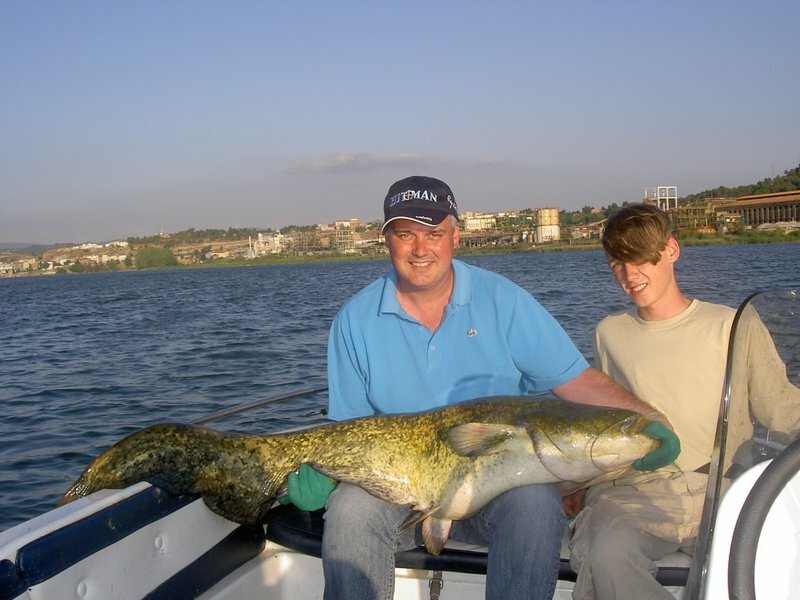 As usual he caught more than me but he generously allowed me to share the glory in the photo with the catfish. His hair is better these days. Lleida is a lot bigger and busier than Tortosa but we made it through the Saturday morning traffic and reached the satnav destination of Ave Dr Fleming without too much trouble. 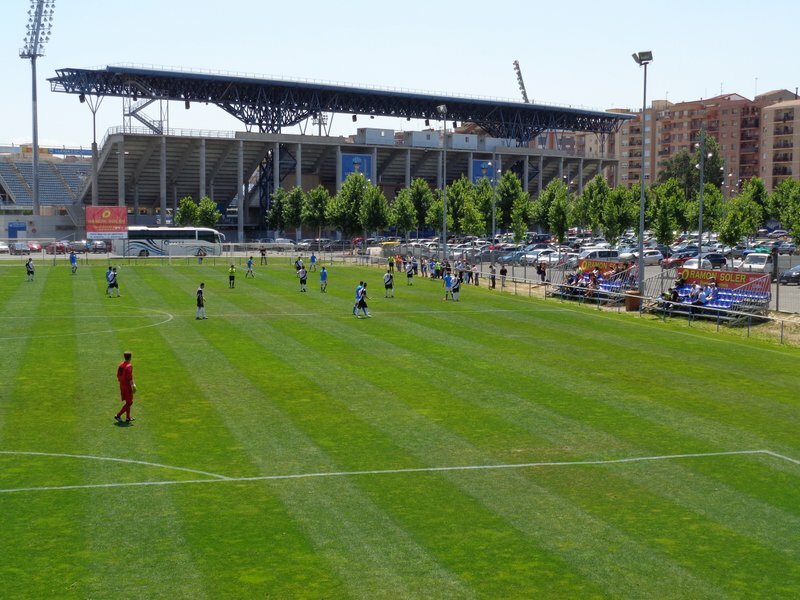 Lleida’s main stadium, the Camp d‘Esportes was in sight and we soon found the practice pitch nearby where the B team matches take place. 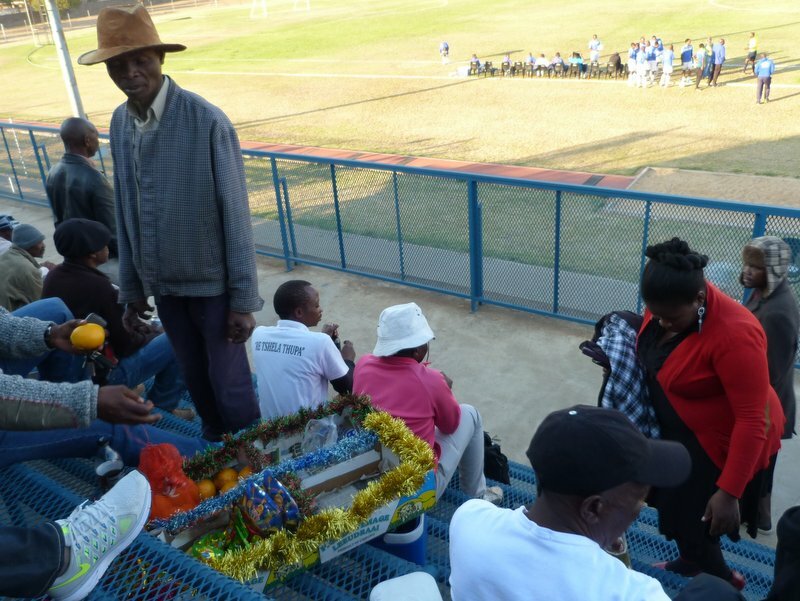 There wasn’t anyone taking money so we just sat on one of the two small stands down the side of the pitch. It wasn’t surprising that it was free entry as there was an unimpeded view from all four sides. 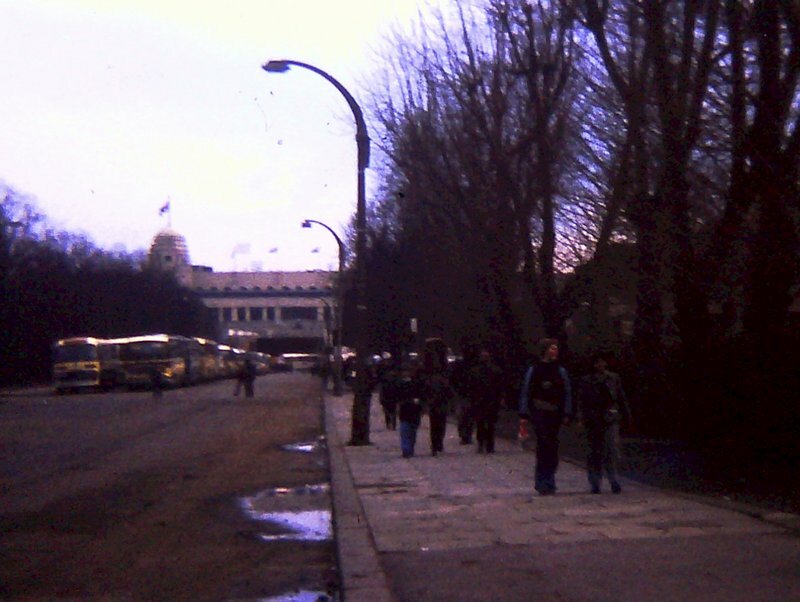 Most people had chosen to sit on the benches where we were but there were maybe twenty or so fans watching from the elevated area behind the goal to our left and a handful more who had parked opposite us and were watching from a roadside position. There was a fella who had a stack of team sheets and he very kindly gave us one. It turned out that he was the media bloke from the club and we chatted a little about Lleida’s season. He asked us why we were there and seemed impressed that we had no reason other than an enjoyment of watching football. 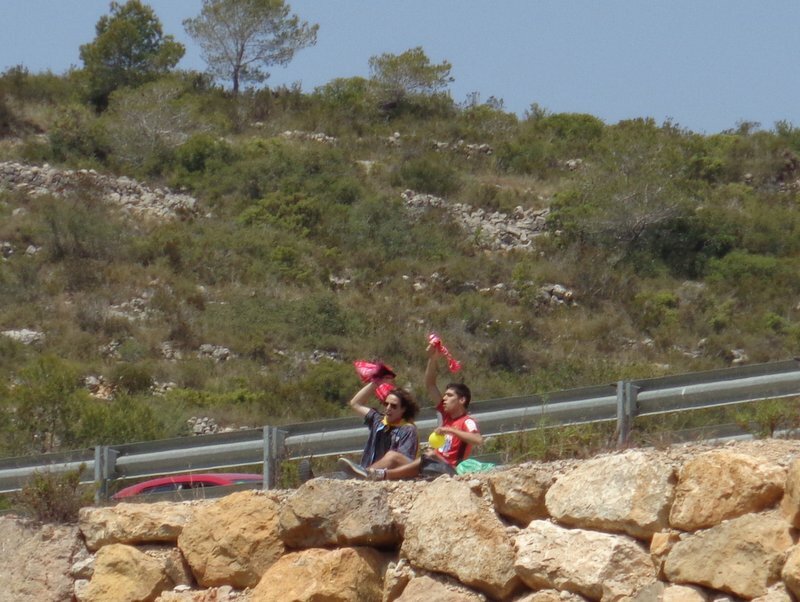 I kept quiet about the two hour drive from Tortosa as I felt that might just tip us into the weirdo category. Lleida were in Italy strips with visitors Amposta in black and white. The fixture was about as meaningless as they come with it being the final game of the season and with neither side in contention for either promotion or relegation. The view from the benches. Both teams played some decent football in the first half, keeping possession well, but Lleida had the edge. Ruiz opened the scoring after ten minutes when he headed home from about six inches out. Another header, this time from Noel doubled their lead before Trota put the hosts three up just before the break. As there didn’t seem to be any facilities at the ground we nipped around the corner to a bar for some half-time refreshment. We rarely do this in South Africa. I watched the second half from behind the goal. It was a decent vantage point but the game suffered from the frequent substitutions. At this level teams can bring on up to five replacements and both sides took full advantage of the rules to give as many players as they could a run out. Lleida even changed their keeper. Becerra scored a late consolation for the visitors, but it was of little consequence. The Amposta players didn’t even bother grabbing the ball and sprinting back for the restart. The victory left Lleida in a mid table finish with Amposta a point ahead of them but still well-shy of the play-off positions. After a lunch that was late by our standards but probably still counted as breakfast time to the locals we headed back across the hills to Tortosa. Well, would you believe it? I’d had a week-long trip to the UK booked since last September and it ended up coinciding with a trip to Wembley. 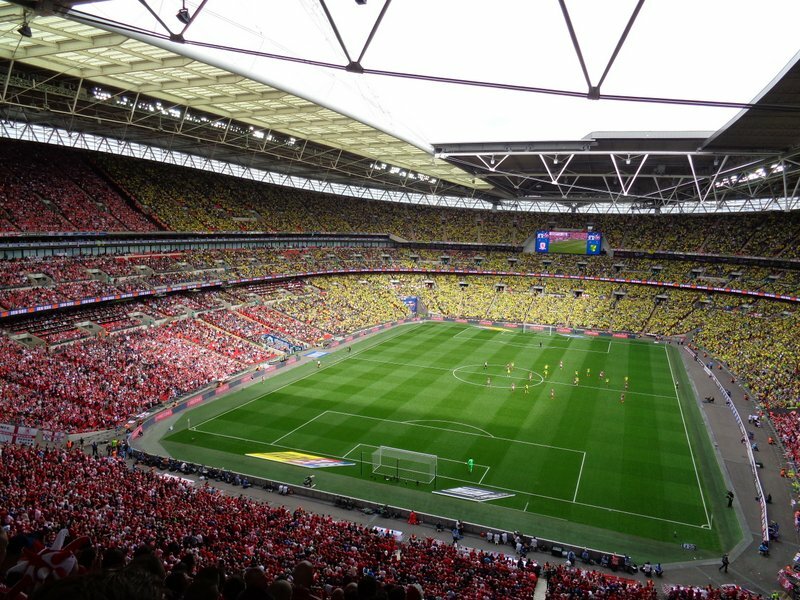 Not just any trip to Wembley either, but the Boro in the play-off final. I’d been hoping that we’d go up automatically but realistically there were eight teams that had similar prospects. Derby failing to even make the play-offs showed how tight it was at the top and in the end fourth place was fair enough. Getting tickets wasn’t too difficult and within an hour of them going on general sale I had the four I needed for myself, my son and two of his mates. 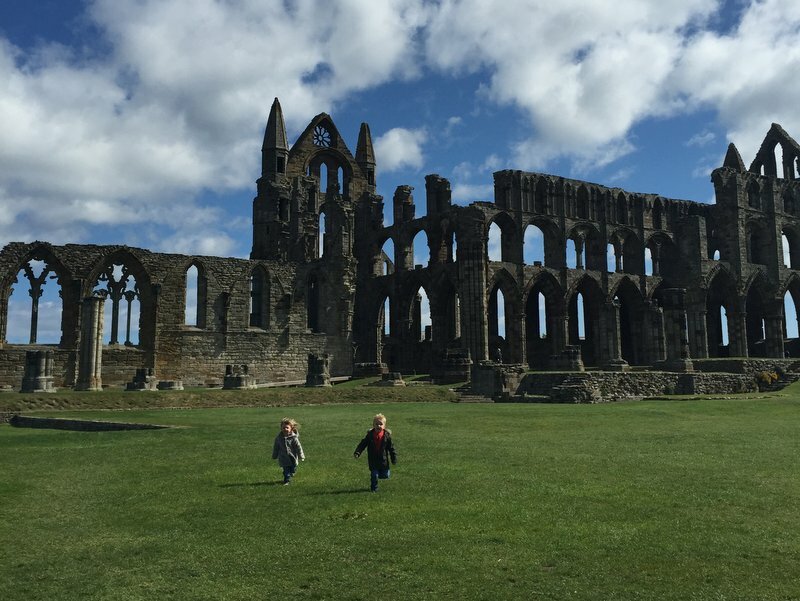 They were all heading down a day early for the Trafalgar Square pre-match party but as I’d rented a house in Whitby and had four generations of family staying I limited myself to driving there and back on the day of the game. A pre-5am start to beat the Bank Holiday traffic meant that I was parked up in what looked like the last remaining spot at Stanmore Station by around half-past nine and a contactless credit card meant that I could skip the queues of fans buying their day-return tickets. As I wasn’t drinking I had no intention of arriving at Wembley five hours in advance of the game and so I stayed on the tube until West Hampstead instead, as that seemed like the sort of place that I might be able to while away some time. It was as I’d anticipated and I spent a couple of hours reading the paper in what I presumed was a trendy coffee shop, although as far as I know Flat Whites and Tall Blacks might have gone out of fashion five years ago. Maybe they are even ironically offered retro-drinks these days. With a bit more time to kill I had a wander in the direction of Swiss cottage. It’s a nice enough leafy suburb and the sort of place that I’d have been content to have lived at sometime if I‘d ever had the spare two or three million quid necessary for a house there. 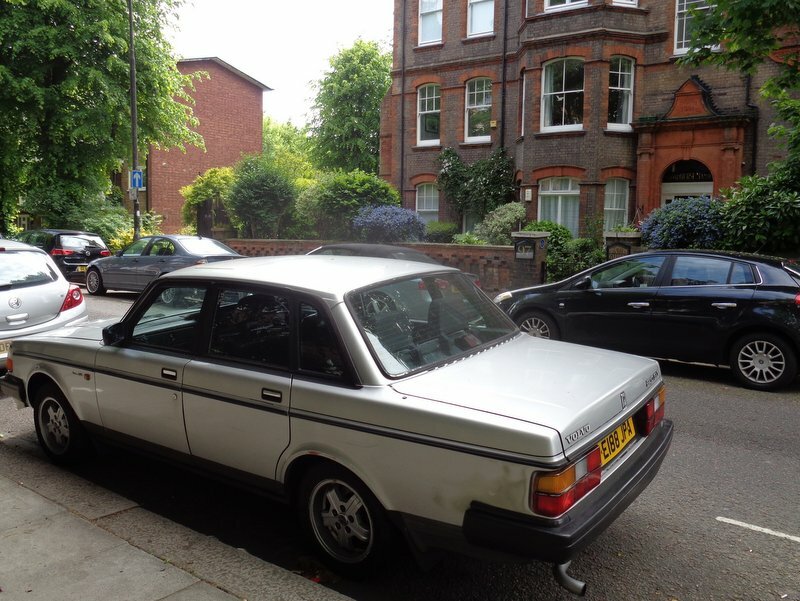 I spotted an old Volvo parked outside of one of the houses. It was the same model that I’d owned in the last days of my first marriage twenty odd years ago. Some lives you never get around to living, others you are happy to leave behind. Mine was slightly older than that one. Before long it was time to get back on the tube to Wembley. 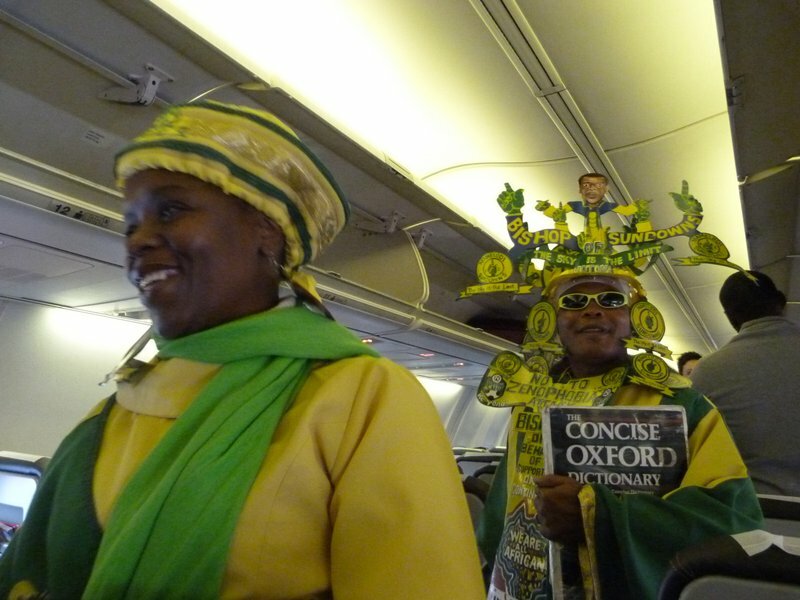 My carriage was full this time, mainly with Norwich fans singing anti-Ipswich songs. I paused at the subway exit and looked down Wembley Way, partly to take in the view but mainly to try to reconcile what I could see with my recollections of the place. As hard as I tried I couldn’t match the current surroundings with my memories. I first went to the national stadium in 1975 on a school trip to watch England schoolboys before taking in a few full internationals in the eighties. I’d been to the previous four Boro games at the stadium but I suppose the last of those was seventeen years ago and so maybe it’s no wonder that the surroundings seemed unfamiliar. Perhaps I was approaching from a different direction. A quick lap of the ground and I was in my seat in block 538 for a pie and a coffee, the kids warm up game and Me Mark Page. It seems as if there is no respite from that fuckwit. If only someone could find him a Saturday daytime slot on hospital radio somewhere. Tom and his mates arrived shortly before kick-off having spent the previous twenty-four hours preparing for the game in a manner that I don’t think my liver is cut out for these days. He thinks he’s a bit of a Jonah having seen us lose four finals. I had to remind him that a lot of the Boro fans in the crowd will have seen those plus the Zenith Data Systems game twenty-five years ago. He was only six months old when we’d lost that one so I’d thought it sensible to leave him at home that time. And the game? If I said it was Typical Boro then you‘ll know how it went. We didn’t play as well as Norwich and they deserved their victory. We’ve struggled this season to get back into games whenever we’ve gone behind and overcoming a two goal deficit was never on the cards. I left as the clock ticked around to ninety minutes and was on the M1 by half past five, leaving the defeat further behind me with every passing mile. It was time to look to next season. I’d seen games at all of the 2010 World Cup stadiums bar one, although at two of them it was rugby rather than football. 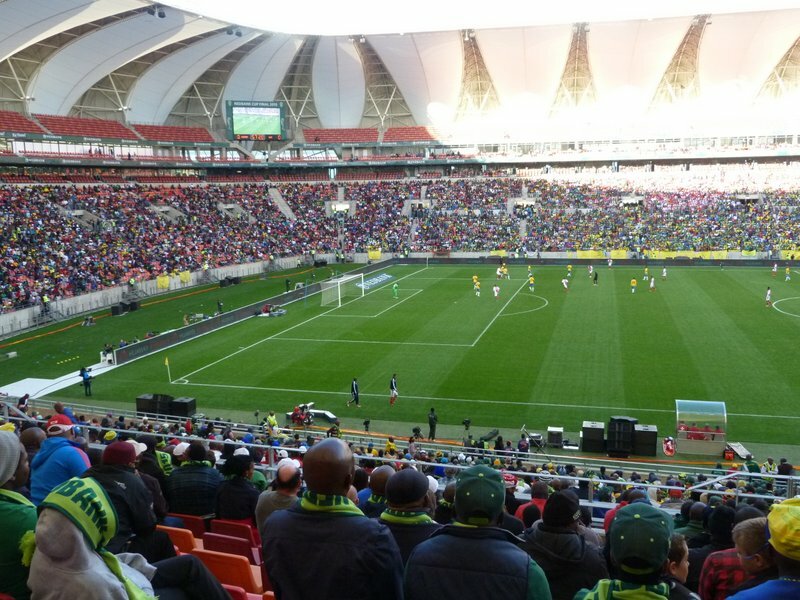 The Nelson Mandela Bay stadium in Port Elizabeth was the missing entry on my list and so the decision to host the 2015 Nedbank Cup Final there turned out to be a pleasant surprise. I should have seen a game at the stadium a couple of months earlier and had gone as far as booking an afternoon off work, flights and a hotel to coincide with a Friday evening Chippa United game. 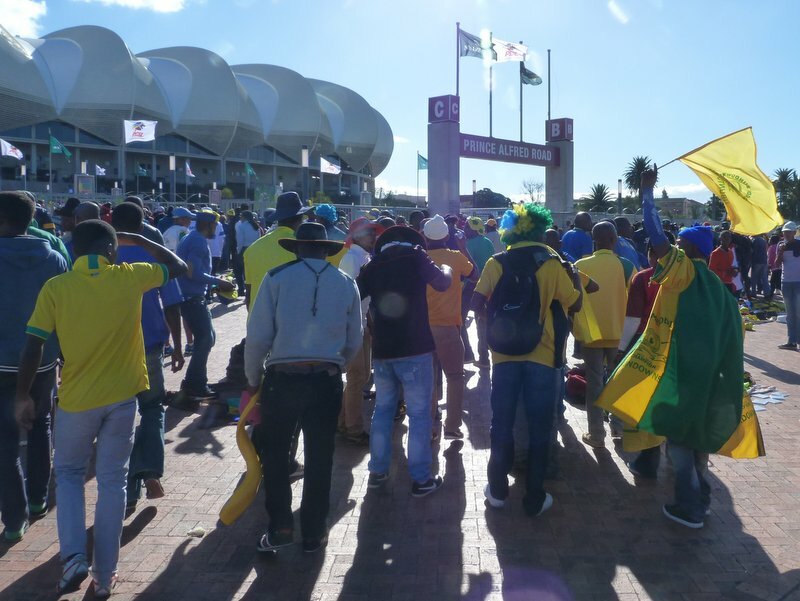 However, as so often happens the date was changed shortly before it was due to take place and whilst we had a nice enough weekend in Port Elizabeth, we didn’t see any football. 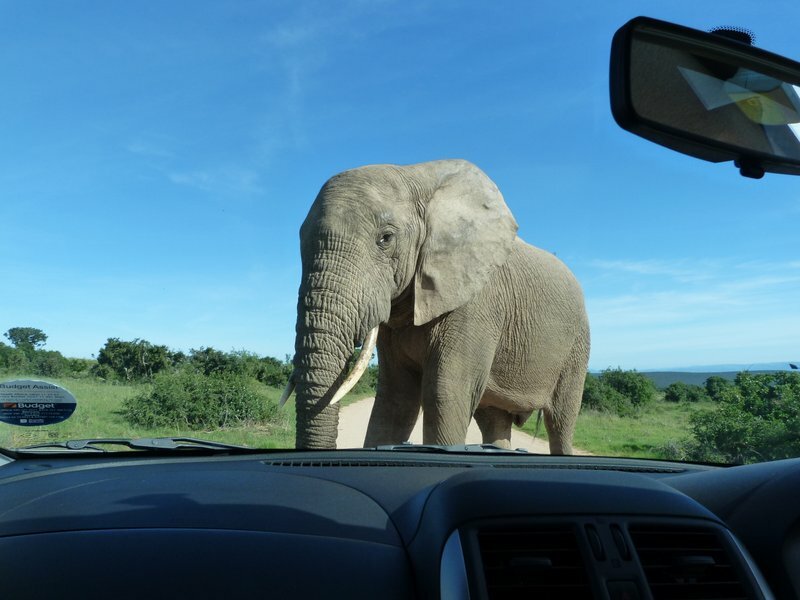 We did get to spend some time in Addo Elephant Park on that previous visit and it was good enough for us to want to do the same again this time. 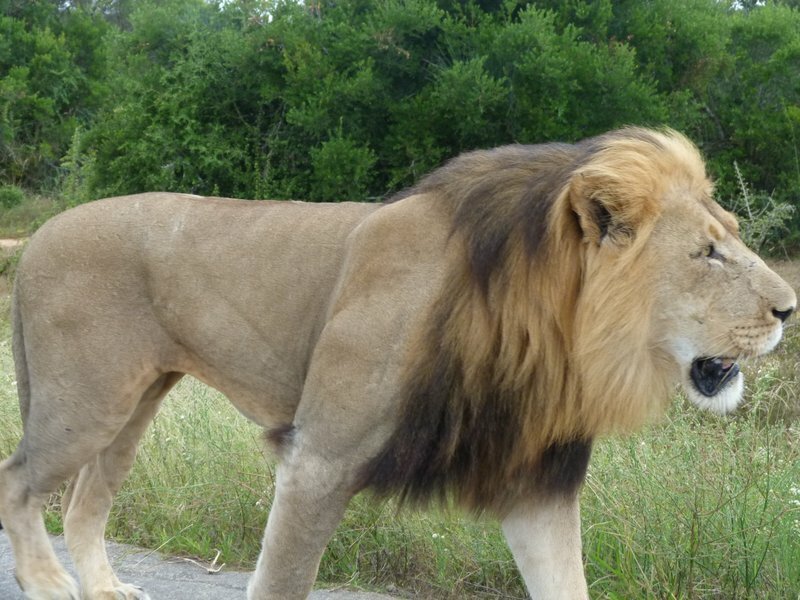 The decision was made easy by the memories of a lion sauntering along the road past our car. Too close to fit the photo. 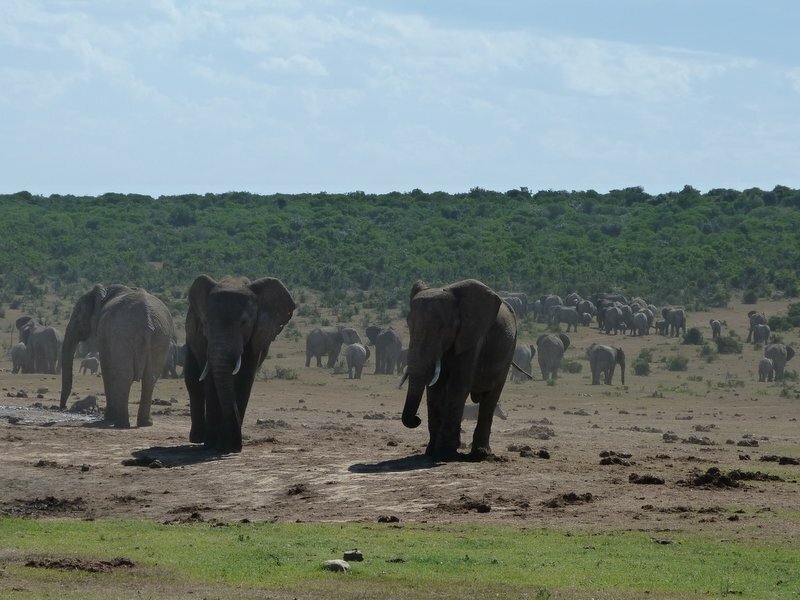 We also stumbled across a herd, or multiple herds, of elephants that had to be close to one hundred and fifty strong. We’ve seen big herds in various National Parks in the past, but nothing to that extent. I suppose it is an elephant park. On that first visit we also did some hiking in an area of the park that had no animals with big teeth. 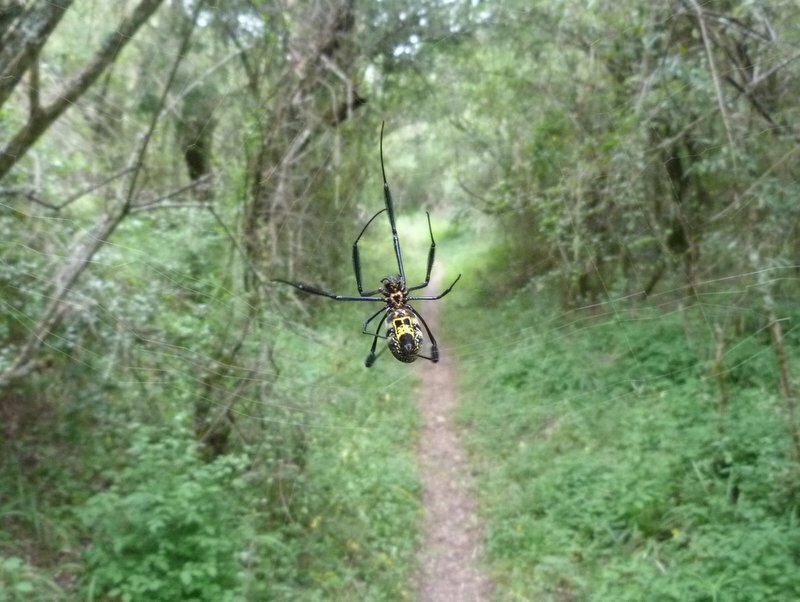 It had plenty of spiders though and as we were the first people on the Zuurberg Trail that morning we unwittingly broke numerous webs with our faces. Just as well it didn’t have big teeth. The highlight of Addo Elephant Park second time around was getting extremely close to some elephants. Close enough that if anything had gone wrong we’d have been the latest wildlife-related mishap to have featured in the Darwin Awards. On one occasion we were parked next to dense undergrowth and we could hear the elephants eating their way through it until they emerged a few feet ahead of us. A little further along the track I pulled up just before a path crossed the road and waited for the elephant walking along it to cross in front of us. I held my breath as it paused within touching distance of the car as if to consider whether to flip us into a ditch. There wasn’t much dispute over Right of Way. And so to the match. The Chiefs and Pirates had both been knocked out of the Nedbank Cup in the quarter-finals, opening the door to Mamelodi Sundowns and Ajax Cape Town. We had a bit of excitement on the way to the ground when the car behind drove into us. There was minimal damage to our hire car and with the rear bumper easily pushed back into position we shook hands and left it at that. 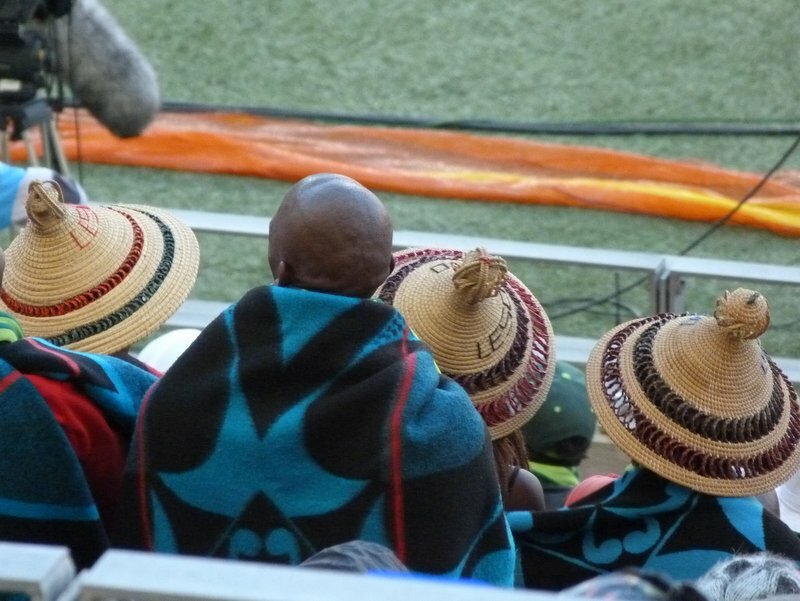 As we spoke to people on the way to the stadium I was amazed at the number of fans of the Chiefs and Pirates that were at the game. 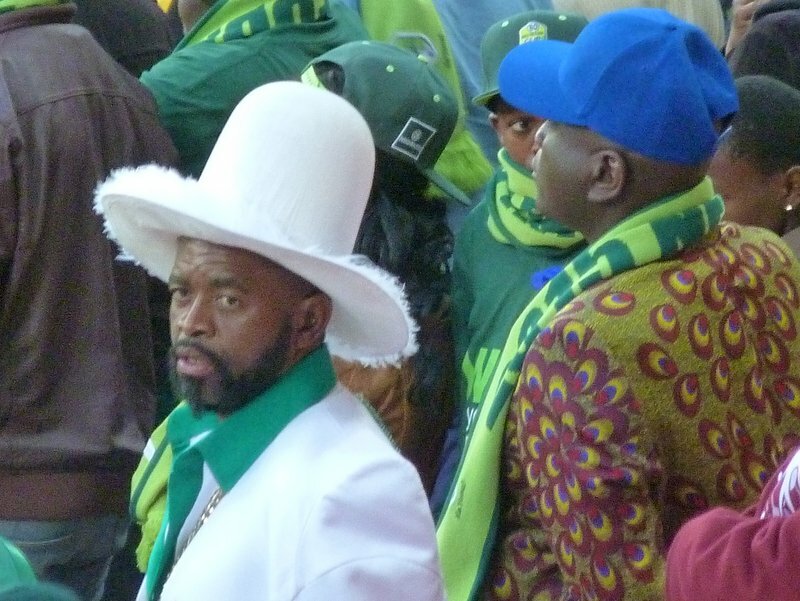 They were temporarily supporting Ajax in the hope that the Sundowns wouldn’t pick up a trophy. It seemed all too bitter to me. Whilst I’d prefer Newcastle or Sunderland not to win anything I doubt I’d go to the trouble of turning up and cheering for their opposition. Unless, of course, the opposition was us. We had posh eighty rand (four quid) seats in the tunnel side stand, but there looked to be just as much room and a good enough view from the forty rand general admission areas elsewhere. It was cold though and I looked enviously at the people who had picked up free scarfs on the way in. 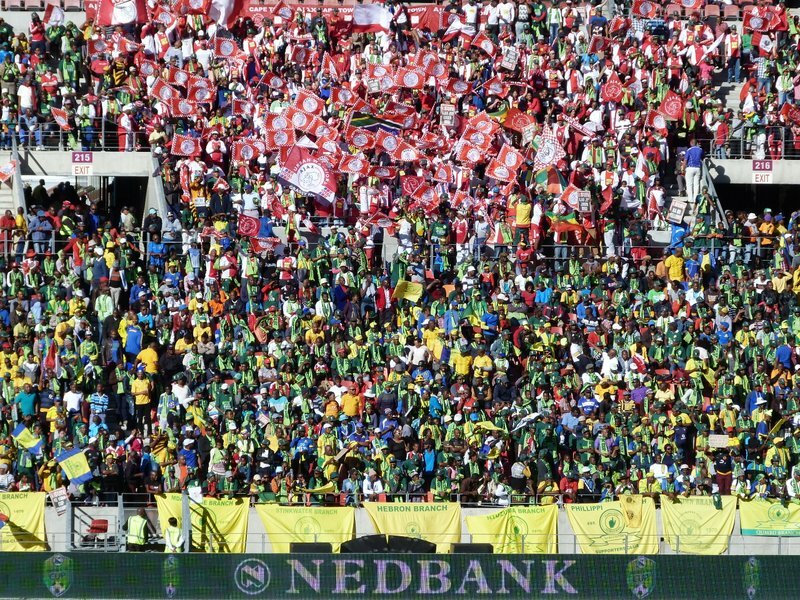 The more vocal of the fans were in the stand opposite to us with the Sundowns supporters taking up positions closer to the pitch whilst those from Cape Town were further up towards the back. It was a fairly even game with both teams limiting the amount of decent chances on offer and it was goalless at the ninety minute mark. As a freezing cold neutral I’d have been happy with a last minute winner for either side, but it wasn’t to be. Extra-time brought little difference and as we neared the final whistle both teams seemed content to play for penalties. It all looked to be going well for Ajax in the shoot-out with, if I remember rightly, them being 3-1 ahead with just two penalties remaining for each side. Defeat for the Sundowns was so close that the Pirates fan next to me got me in a bear hug and kissed me. I was grateful for the warmth and appreciated the lack of tongues. As so often happens though, the big team wins. 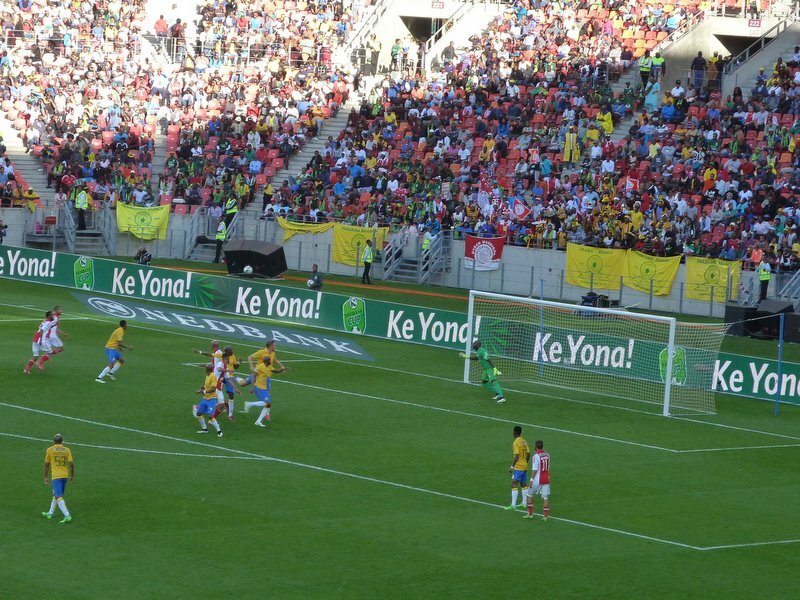 Ajax missed their remaining two chances to seal the victory and Sundowns drew level before clinching the trophy in the sudden death penalty phase. The fella next to me had slunk away at 3-3, no doubt to avoid the prospect of being kissed by any of the celebrating Sundowns fans.